Just listed in Lakewood, Ohio! 18428 Sloane Ave. is an adorable, updated colonial with 3 bedrooms and 1 bathroom located on Lakewood’s west end. Listed at $149,900. If you’re house hunting in Lakewood, Ohio, you’ll appreciate some of the features this home has to offer that aren’t always found in Lakewood colonials. This home has a newer forced air furnace, central air, a 2-car garage, a private backyard setting with a bonus yard behind the garage, updated Champion windows, larger closets, a clean basement and all major mechanicals updated within the last 5 years including the roof. All appliances stay, making this home move-in-ready! Follow me on Facebook, Twitter and Instagram to stay connected and for great tips & information. 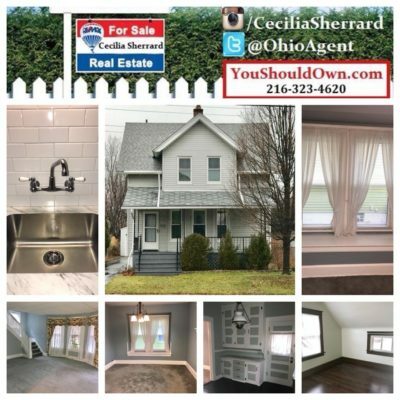 New listing in Lakewood, Ohio 44107 presented by Cecilia Sherrard with RE/MAX Real Estate Group. Assisting home buyers and sellers in Lakewood and surrounding cities since 2002. Search all homes for sale using the RE/MAX home search. Lakewood, Ohio home buying, Lakewood, Ohio real estate, Lakewood Ohio Realtor, RE/MAX Lakewood. Buying a home, selling a home, Homes for sale, Properties in 44107. Hello there o was wondering do you take section 8 rent to own.